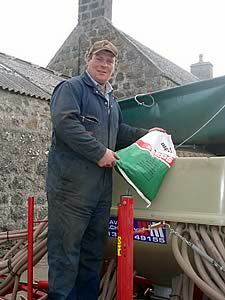 SAC is backing Aberdeenshire farmer John Moir as he looks forward to the final of the 2009 Nature of Farming Award. The Award, run by the Royal Society for the Protection of Birds in association with BBC Countryfile, Plantlife and Butterfly Conservation recognises farmers who manage their land sensitively in the interests of wildlife and the environment. John Moir, who farms close to the Loch of Strathbeg, south of Fraserburgh, has already won the Scottish heat and is on the short list for the UK title to be announced in September. The 668-hectare, Cairness Farm is home to a commercial herd of Angus Cross cattle and Scotch Mule ewes, as well as organic cereal crops. However, it is also visited each year by thousands of pink-footed geese and a good population of nationally threatened corn buntings. For John and his family, managing their trees and the environment is as important to their business as the traditional enterprises. SAC consultants, like Turriff-based Mike Fettes, have worked closely with the Moirs and congratulate them on their success. "We have been involved with John for several years in planning and developing the current habitat management systems. During this time John, through environmental and woodland schemes and organic conversion, has adapted his farming system to encourage scarce animal and plant species, reduce the past losses of habitat and endangered species, like the corn bunting." There has been a significant rise in corn bunting numbers, from 5 singing males in 2006 to 8 in 2007, and 14 in 2008. In addition, changes to grassland management, leaving areas of unharvested crop and features like beetle banks have helped many other species. According to Mike Fettes success at Cairness has involved various agencies working together. “Co-operation between SAC, SOPA, RSPB and SNH consultants, through various EU and Scottish Government-funded environmental initiatives, has meant a joined up approach that has benefitted both the environment and the farming business. What the Moirs have shown is that more farm businesses could benefit by developing a vision for the long term care of the wider environment and important species." As the Scottish finalist John received a commemorative plaque and a cheque for £200 at the Royal Highland Show. If he is successful in the overall UK competition he collects a cheque for £1000. The public can cast their votes for John on the RSPB website until entries close on 28th August.